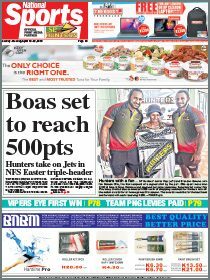 FC Port Moresby’s deadly striker Neil Hans is fast becoming a hated name on the football pitch. The young left-footed Madang man showed no mercy as he rifled home five goals to help his team thrash cellar dwellers, WNB Tavur 7-0 in their last match at the Sir John Guise Stadium in Port Moresby on Saturday. He scored a Telikom National Soccer League trifecta in the first half and added two more in the second to set the foundation of his team’s victory. The other goals came from Max Sengum and Felix Bondaluk, who made his return to the starting team with a brilliant goal in the first half to start the Tavur’s misery. WNB Tavur were without their Lae-based players in Sowera Guti, Kohu Liam and Mante Kavoi. The John Raka-managed team had the crowd on their feet on several occasion but the FC Port Moresby defence led by Cyril Muta was just as good to deny them from scoring. Player/coach Reginald Davani was pleased with the performance, saying they wanted to cement their position to play in the finals when it starts in two weeks. Despite the absence of striker Alwin Komolong, who is in Zurich for the FIFA Youth tournament, FC Port Moresby has a surplus of players who are capable of filling in. In the early game, Besta PNG United captain Jamaal Seeto scored a second half double to force a 2-2 draw with reigning premiers, Hekari United in the opening match played at the Sir John Guise Stadium in Port Moresby. The Harrison Kamake-coached team were trailing 2-0 at half time, but came back strongly. 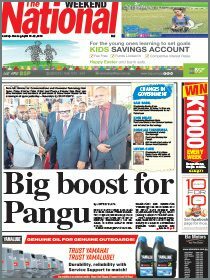 Hekari can only blame themselves as they had greater opportunities than the PNGFA Academy-based team. In fact, Hekari strikers Joachim Waroi and Raymond Gunemba were out of touch. Besta came close to sealing the match but their chances were thwarted by good defence by Koriak Upaiga, Taniela Waqa and Pita Bolaitoga. In Lae, Eastern Stars came from behind to force a draw with Welgris FC 1-1, while Gigira Laitepo Morobe FC beat NC Oro 2-0 to consolidate its spot in the finals.